Viceroy Santa Monica: a Happening Design Hotel Near the Beach in L.A.
Viceroy Santa Monica, a Design Hotel Near the Beach in L.A.
Viceroy Santa Monica is a design-centric. private-feeling hotel in L.A. It is set a block from the Pacific Ocean beach (but not on the beach) in the upscale surfside community of Santa Monica. Viceroy Santa Monica attracts a hip, stylish crowd, some of whom work in the entertainment industry. A relaxed, lounge-y vibe is furnished by hotel's Cameo Bar and cabana-lined pool. And Viceroy Santa Monica's excellent indoor-outdoor restaurant, Whist, invites lingering. Viceroy Santa Monica belongs to the growing, LA-based Viceroy Hotel Group. This hotel management company operates finely designed properties in the US, Mexico, the Caribbean, and in exotic ports of call like Abu Dhabi and the Maldives. Viceroy Santa Monica opened in 2002 and was beautifully designed by Kelly Wearstler. Its elegant yet light-hearted style seamlessly combines elements of Art Deco and glmaorous "Hollywood Regency." The pool area is done in pure Silver Screen style, with nostalgic black and white cabanas. The hotel is very comfortable, with plush lounge chair in the lobby and in all rooms. Viceroy Santa Monica is also quite eco-conscious, and filled with sunlight and natural materials. Will You Like Staying at Viceroy Santa Monica? Location of Viceroy Santa Monica Hotel in L.A.
Viceroy Santa Monica is set in LA's charming beachfront city of Santa Monica. The hotel is relatively close to LAX, about a half hour. Rooms & Suites at Viceroy Santa Monica Hotel in L.A.
Viceroy Santa Monica's 162 rooms and suites have an Art Deco-meets-1960s Hollywood look. This pleasing décor was masterminded by LA-based designer Kelly Wearstler. The palette is soft gray and white, with sunny yellow and cool silver accents. Room categories range from the standard City View room (320 square feet) to the grand Monarch Suite (780). Room wifi and bottled water carry a price tag, which is annoying. There's no in-room coffee maker or complimentary newspaper, but both are offered free in the hotel lobby all morning. Bathrooms at Viceroy Santa Monica are all marble. They are equipped with a large walk-in shower and a backstage-style sit-down dressing area. Amenities by Neil George, including body wash, conditioner and shampoo, are housed in pump-style dispensers refilled by housekeeping daily to minimize plastic waste. A shelf holds other products for purchase. Dining & Drinking at Viceroy Santa Monica Hotel in L.A. Excellent Dining at Viceroy Santa Monica in L.A.
Whist, the hotel's sole and outstanding in-house eatery, is very popular with guests and with Santa Monica locals. It serves breakfast, lunch, dinner, and 24-hour room service. The well-run and creative kitchen is helmed by a protégé of Jean-Georges Vongerichten, chef Tony DiSalvo. His cooking is innovative and global. Whist's appealing, elcectic menu is strong on small plates. Surefire hits on the dinner lineup: lamb kefta meatballs and chili-sparked chicken with kimch'i. Whist diners can sit indoors or out. The al fresco dining tables fronting the pool are in high demand, so make these reservations when you check into the hotel. Cameo Bar, named for its stylish black-and-white motif, is a comfortable, lounge-like space. Its extensive cocktail list offers hand-mixed cocktails, some based on retro spirits like rye and gin. Plenty of California wines are available by the glass, too. Service, Pool, & Gym at Viceroy Santa Monica Hotel in L.A.
Service at Viceroy Santa Monica is attentive and considerate. Check-in is a stressless, sit-down affair, managed rapidly and cheerfully at a trio of desks. Hotel staffers look out for guests. When I discovered that the poolside dispensers of iced lemon water had been taken down, a concierge brought me a glass from the bar. Use of Viceroy Santa Monica's business center is not on the house. Neither is wifi in rooms, cabanas, or on the patio. However, wifi comes free of charge in the lobby and Library. Most hotels that lack coffeemakers want guests to buy their coffee from a lobby vender. But Viceroy Santa Monica dispenses coffee gratis at Cameo Bar in the morning. Viceroy Santa Monica observes a pet-friendly hotel policy. Only dogs are permitted, and owners must pay a $100 housekeeping fee. Guest who come by car must valet-park for a fee; the city of Santa Monica forbids overnight street or lot parking. 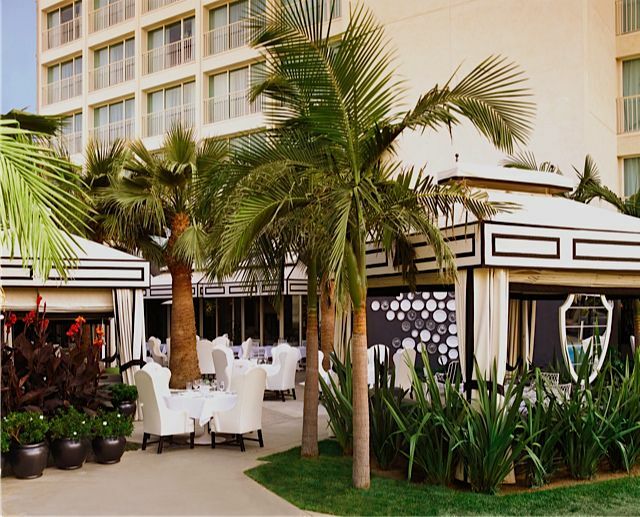 Viceroy Santa Monica's "back yard" is a huge patio with a fashionable Hollywood mood. This rambling space offers lounge chairs, private cabanas, two pools, and several dining tables for Whist Restaurant patrons. On sunny days, many hotel guests make the patio their de facto office. Wifi is available for a daily charge. Cabanas are available for a hefty fee. Larger cabanas are often rented for business or social events. Viceroy Santa Monica has a small fitness room that is free to guests. It features a few cardio machines, free weights, kettlebells, a Cablecross pulley system, and floor equipment like mats and stability balls. The hotel offers well-attended, complimentary fitness classes two mornings a week. Typical offerings are yoga and a shape-up regimen called Beach Boot Camp. Mats, water, and towels are included. Connect with Viceroy Santa Monica Hotel in L.A.
As is common in the travel industry, the Guest Author was provided with a complimentary visit for the purpose of describing the hotel. For more information, see our site's Ethics Policy.